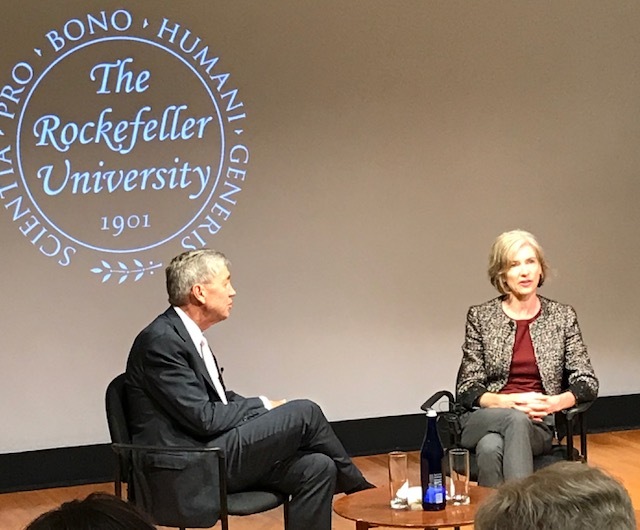 At this point in her career, Jennifer Doudna, Ph.D., is not a stranger to receiving awards, having been awarded the highly prestigious Kavli Prize last month. Earlier this week, she received another award, the Pearl Meister Greengard Prize from The Rockefeller University, the meaning of which goes far beyond notoriety and money. The prize, which was the vision and work of Paul Greengard, Ph.D., a neuroscientist at The Rockefeller University and his wife, the sculptor Ursula von Rydingsvard, was launched in 2004. The seed money for the award came from Dr. Greengard’s donation of the full share of his own 2000 Nobel Prize in Physiology or Medicine. The prize is named in memory of Dr. Greengard’s mother, who died giving birth to him, and includes a $100,000 honorarium. Dr. Greengard’s goal was to start an international award recognizing outstanding women in biomedical science, because he felt that women are not recognized at a level commensurate with their scientific contributions. Richard Lifton, M.D., Ph.D., the president of The Rockefeller University, notes that the work of the recipients has been “among the most remarkable discoveries of the last 60 years.” Dr. Greengard says that he “would like to think that the prize has contributed to the greater equality being afforded women now” although he notes that there is still a long way to go. The Pearl Meister Greengard Prize may do even more than that, says Leslie Vosshall, Ph.D., professor at The Rockefeller University. Dr. Vosshall notes that “the myopia about “there are no good women” goes away when you look at the recipients of the prize” adding that the prize gives the Nobel Prize Committee ideas of who they should be considering. The most recent winners have included JoAnne Stubbe, Ph.D. the first woman to receive tenure in the chemistry department of Massachusetts Institute of Technology (MIT), Bonnie Bassler, Ph.D., professor and chair of molecular biology at Princeton University, Helen Hobbs, M.D., director of the Eugene McDermott Center for Human Growth and Development at the University of Texas Southwestern Medical Center and Lucy Shapiro, Ph.D., director of the Beckman Center for Molecular and Genetic Medicine, Stanford University School of Medicine. The decorated Dr. Doudna, professor in the department of chemistry and chemical engineering and the department of molecular and cell biology at the University of California, Berkeley, is a deserved recipient, as one of the founders of the CRISPR-Cas9 revolution. Her early work uncovered the basic structure and function of the first ribozyme, a type of catalytic ribonucleic acid (RNA) that helps catalyze chemical reactions. This research led to her pioneering the CRISPR-Cas9 gene editing tool and positioned her as a leader in the ongoing conversations about gene editing.